Stacie Faulds, Cruise Planners’ Director of Marketing accepts the International Franchise Association FranTech Award on behalf of Cruise Planners in San Diego, Calif.
“When designing new technology, we strive to provide high-tech solutions for franchisees that strengthen the connection between travel agents and their clients,” Michelle Fee, CEO and co-founder of Cruise Planners. 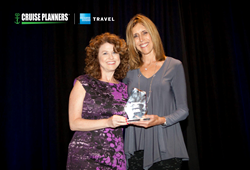 The nation’s leading home-based travel franchise, Cruise Planners®, an American Express Travel Representative, recently earned a FranTech Award from the International Franchise Association (IFA) and continues to stand out as a leader in innovation and technology. Presented at the 2017 FranTech Franchise Innovation Conference, October 19-20 in San Diego, the IFA award recognized Cruise Planners for its 2017 Technology Suite for travel agents which includes CP View™, CP Insights™ and the newly redesigned corporate website. Announced to travel agents at its 2017 Annual Conference on October 16, Cruise Planners continues to make strides in technology and innovation by becoming the first home-based travel agency to enter the world of Artificial Intelligence with the introduction of two new Alexa Skills making vacation planning easy for consumers and serve as a virtual assistant for travel agents. Stacie Faulds, Cruise Planners’ Director of Marketing accepts the International Franchise Association FranTech Award on behalf of Cruise Planners in San Diego, Calif. Cruise Planners earned this award for its 2017 launch of technology solutions for its franchisees. Cruise Planners®, an American Express Travel Representative, is the nation’s largest home-based travel agent franchise network in the travel industry. Cruise Planners operates a network of more than 1,800 franchise owners who independently book amazing vacation and travel experiences for their clients. The Florida-based Home Office Team positions a nation-wide network of franchise owners for success by providing innovative marketing, booking and technology tools, as well as professional development and hands-on training with the industry’s top executives. The company continues to be lauded and has been named the No.1 travel franchise by Entrepreneur magazine for 14 consecutive years. Cruise Planners was recently featured in Entrepreneur as one of the top 30 franchise innovators in technology, has been consistently named as one of the Top Women-Owned Businesses by the South Florida Business Journal, is on the Inc. 5000 list as one of the fastest-growing private companies in America, has been ranked as the #1 travel franchise by Franchise Business Review for 6 years in a row, and was recognized as one of the Top Workplaces by the Sun Sentinel since it started ranking companies. Headquartered in Coral Springs, Fla. with more than 23 years of experience, Cruise Planners has achieved top producer status with every major cruise line. Accolades include numerous Magellan Awards from Travel Weekly, American Express Travel Representative Excellence Award for 13 consecutive years (2004-2016), American Express Agency of the Year (2010), Royal Caribbean International Chairman’s Award (2015), Royal Caribbean International President’s Award for Overall Achievement (2012 and 2014), Royal Caribbean International Home-Based Partner of the Year (2007-2013), Norwegian Cruise Line Elite Agency of the Year (2016), Norwegian Cruise Line Franchise Agency of the Year (2011-2015), Celebrity Cruises Home-Based Partner of the Year (2016), Celebrity Cruises Field Sales Account of the Year (2015), Celebrity Cruises Home-Based Account of the Year (2013-2014) and Celebrity Cruises Southeast Region Travel Agent Partner of the Year (2010), Ted Arison Founder’s Award – Carnival Cruise Line (2017), Travel Impressions Best of the Best Globe Award (2008-2016), Sandals Top Host – Worldwide, Globus Family of Brands Premier Agency Partner (2009-2016), Platinum Circle Member with Viking River Cruises (2009-2015), Uniworld Boutique River Cruise Collection Top Producer (2008-2014) and Regent Seven Seas Cruises Top Producer. Cruise Planners is one of the Top 50 franchises for Veterans according to GI magazine, the Top Franchise Brand for Veterans according to Franchise Business Review, has been named one of the Top 25 franchises for African-Americans by Black Enterprise magazine and is a member of the International Gay & Lesbian Travel Association. For more information, visit http://www.cruiseplanners.com. Stay in Touch: Media can stay up-to-date with Cruise Planners by visiting our media room, following us on Twitter @Cruisitude or on Facebook. For additional information or to make reservations, vacationers should locate a travel advisor near them. For those interested in becoming a franchise owner, please visit the Cruise Planners franchise website.